You can select up to 10 travelers in total. The Klondike Gold Rush National Historic Park is an ideal location to experience Alaska’s natural beauty and gold rush history. 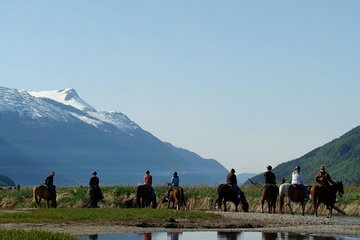 This tour saves you the hassle of (horse) navigation and gives the riding knowhow to travel the park’s trails on a horse, visiting Dyea ghost town and the Chilkoot and White Pass trails. Plus, your tour includes round-trip transportation from Skagway and local snacks. Hillary and Julia were great guides and were very knowledgeable both about the horses and the area. They selected the perfect horses for both myself and my daughter. Worth every minute. Appropriate for all levels of ability and confidence!! Thanks Ladies! !